Srinagar, May 15, (Scoop News)- Chief Minister, Mehbooba Mufti today announced release of Rs. One crore each in respect of all the MLAs of Srinagar District for rebuilding social infrastructure in their constituencies even as the District Capex Plan has been pegged at Rs. 149.54 crore for 2018-19. Chairing the District Development Board meeting of Srinagar district here today, the Chief Minister also announced release of Rs. five crore to be kept at the disposal of SKIMS for establishing a Cancer Centre there. A similar release of Rs. five crore would be made for Jammu for establishing a Cancer Centre there as well, the Chief Minister announced. She also directed earmarking Rs. 10 crore for constructing Community Halls in various parts of the city, particularly Shehre Khaas. Ministers, Syed Altaf Bukhari, Javed Ahmad Mir, Muhammad Ashraf Mir, Asiea Naqash; legislators, Ali Muhammad Sagar, Mubarak Gul, Shamima Firdous, Noor Muhammad, Moulvi Abid Ansari, Ishfaq Jabbar, Khursheed Alam and Anjum Fazili were present in the meeting. 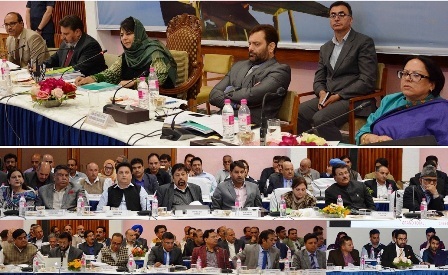 Mehbooba Mufti directed the officers to undertake repair of lanes, drains, macadamisation of roads and strengthening of power distribution system in the Srinagar city, particularly Shehre Khaas, on priority adding that the allocations of Rs. One crore each be utilized for pacing up these works. She said there is a need for developing more parks and green spaces in the city and till the Smart city project kicks off these interventions should be made on priority. The Chief Minister also directed immediate operationalisation of Radpora stadium and identifying a patch of land at Iddgah for establishing a children’s park there. She also directed completion of heritage gate by Tourism Department at Iddgah for which she asked the IGP Kashmir zone to sort out issues with CRPF. She also asked the Health Department to explore the possibility of shifting the shopkeepers at Gousia hospital to a nearby complexl and use that space for hospital activities. The meeting was informed that five bridges are being commissioned in the city soon besides two each schemes under CRF and NABARD. Also an expert team from New Delhi is coming to Srinagar to survey the need for establishment of grade separators at various spots in the city to arrest the traffic congestion. Besides, the meeting was informed that Cluster University, Srinagar and SPS Library complex at M A Road are almost ready for operationalization and two colleges at Zakura and Bagh i Dilawar Khan would be inaugurated by year end. Besides work on additional blocks at LD Hospital is on and a project for Rs. 19 crore has been projected for compensating the relocation of shopkeepers coming in the construction of Mini Secretariat, Batmaloo. The Chief Minister directed to look into the causes of cost escalation of projects and check this unhealthy trend so that projects are not left midway for paucity of funds. The meeting was also informed that projects worth Rs. 65 crore are under execution in Sports and other youth activities in the district. The meeting was informed that to tide over the problem of dispruption in power supply the capacity of grid stations is being enhanced besides commissioning some new grid stations. Alastaing Grid station, the meeting was informed, is expected to be commissioned by October this year along the commissioning of Srinagar-Kargil-Leh transmission line. Also work on grid stations at Bagh i Ali Mardan Khan and Tengpora is going to be started shortly. Also, the meeting was informed, the existing grid stations in the Srinagar city would be expanded in capacity by addition of more transformers to tide over the problem of frequent power cuts, low voltage and other issues. These measures on completion are expected to give major relief to people in coming winter from power disruptions. Mehbooba Mufti asked the Chief Secretary to monitor the pace of work and capacity enhancement on these grid stations regularly so that these are operationalized before the onset of winter this year. She also directed the Divisional Kashmir, Kashmir to sort out the issues of land acquisition coming in the way of construction of some of these grid stations. Later, the board approved an enhanced outlay of Rs. 149.54 crore for the district for 2018-19. Chief Secretary, B B Vyas; Financial Commissioner, Housing & Urban Development Department, K B Aggarwal; administrative secretaries of all the Departments; Divisional Commissioner, Kashmir, Baseer Ahmad Khan; IGP Kashmir zone, S P Pani; heads of all the Departments; officers of Divisional and District administration were present in the meeting.